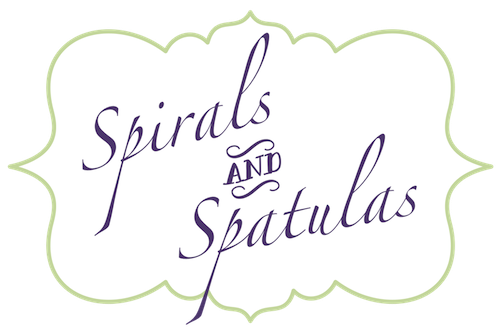 Spirals & Spatulas: Gifts for my Bridesmaids! 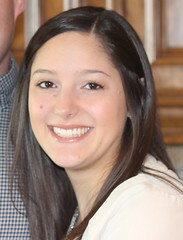 I wanted to give my bridesmaids gifts that were thoughtful and useful, so I came up with a three-part gift that the ladies will (hopefully!) love. Hopefully they can get some wear out of them post-wedding as well! Monogrammed items are the go-to bridal party gift. A lot of brides do tote bags, but who doesn't have a million tote bags sitting in their closet unused? I thought about makeup bags, but I think girls are pretty particular about size, color, etc. for that sort of thing. Then one day I was thinking about "Getting Ready" photos, and it hit me: Monogrammed Robes! I found some great monogrammed robe options on Etsy and elsewhere online, but all of them seemed to use the same One-Size-Fits-All robe (described as "generously sized"). Some of my bridesmaids are quite little, and I sooo didn't want them to be drowning in giant robes. So I found these Adonna robes from JCPenney - they come in Small, Medium, and Large, and they are soooo soft! I ordered the girls' robes in an Aqua color, and one in white for Me! 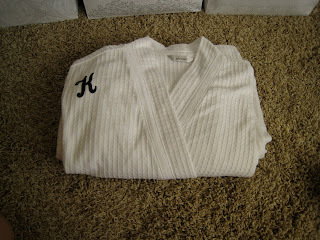 When they came in the mail I picked up some iron-on embroidered letters from Hobby Lobby, and I monogrammed each robe. We'll all wear them while we do Hair & Makeup at my parents' house...hopefully it makes for some cute pictures! Part Three - The Bath Stuff! I wanted to make absolutely sure that the girls got something in their gift that they could use. I mean...what if they don't like the earrings and the robe doesn't fit right? Or something crazy like that? So I bought each girl Creamy Body Wash and Hand Lotion from Bath and Body Works in Japanese Cherry Blossom. LOVE this scent!